Posted on 9, May 2016 by EuropaWire PR Editors | This entry was posted in Defence, Italy, Security & Safety, Technology and tagged AgustaWestland AW609 TiltRotor, Leonardo-Finmeccanica. Bookmark the permalink. ROME, 09-May-2016 — /EuropaWire/ — Leonardo-Finmeccanica announced today that the third prototype (A/C3) of the AgustaWestland AW609 TiltRotor has completed its first ground run at the company’s facilities in Cascina Costa, Italy, marking a critical milestone as the programme advances its testing and plans a resumption of flight testing activities. 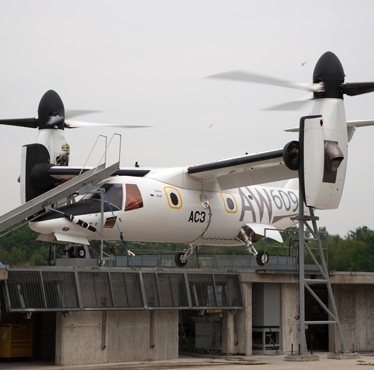 Aircraft AW609 A/C3 began restrained ground run testing with all engines and systems operating. These tests prepare the prototype for FAA certification flight testing this summer at the company’sPhiladelphia facility, where it will demonstrate that its capabilities satisfy a stringent set of airworthiness standards for the world’s first commercial powered lift aircraft. Taking off and landing vertically, the AW609 is capable of flying within an envelope that includes cruise conditions up to 275 knots, at an altitude of 25,000 feet in a pressurized cabin, for missions with ranges up to 1000nm with available fuel options. This aircraft will mark a new era in civil aviation. Testing plans for the A/C3 also include icing trials in the winter of 2016 to demonstrate its capabilities in known icing conditions. These high standard design features allow the AW609 to perform a host of missions not previously achievable with any other commercial aircraft. The ground run of the third prototype followed a restarting of test activities of the first prototype (A/C1) on April 15, 2016. The fourth prototype A/C4 is undergoing assembly in Philadelphia with plans to enter the test fleet in 2017. Certification of the first commercial tiltrotor is expected in 2018, with deliveries to customers to follow.